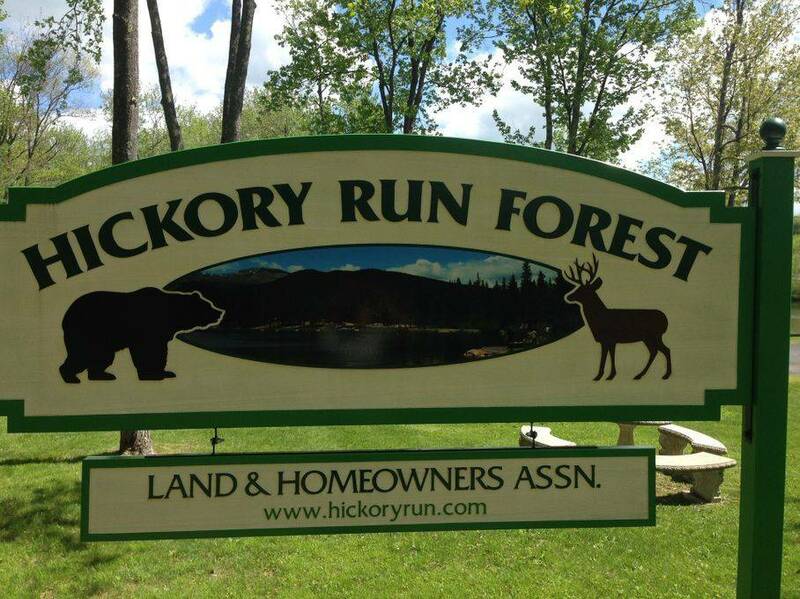 Hickory Run Forest Land and Homeowners Association is a private residential community located in Penn Forest Township, Carbon County, Pennsylvania. We are located north of the historic town of Jim Thorpe, Pennsylvania. As a private community there are specific rules and regulations on building, control of pets, operation of ATVs and other things that affect the quality of life for the association. Use of fireworks and discharge of firearms is strictly prohibited within the community. Please see Rules and Regulations under the "More" tab for a complete listing. Yearly dues are payable starting in January and are handled by our management company, NEPA Management, Inc. located at 7164 Rt. 209, Stroudsburg, PA 18360. Their phone number is 570-421-5409, ex 329. Bills can also be paid on-line. 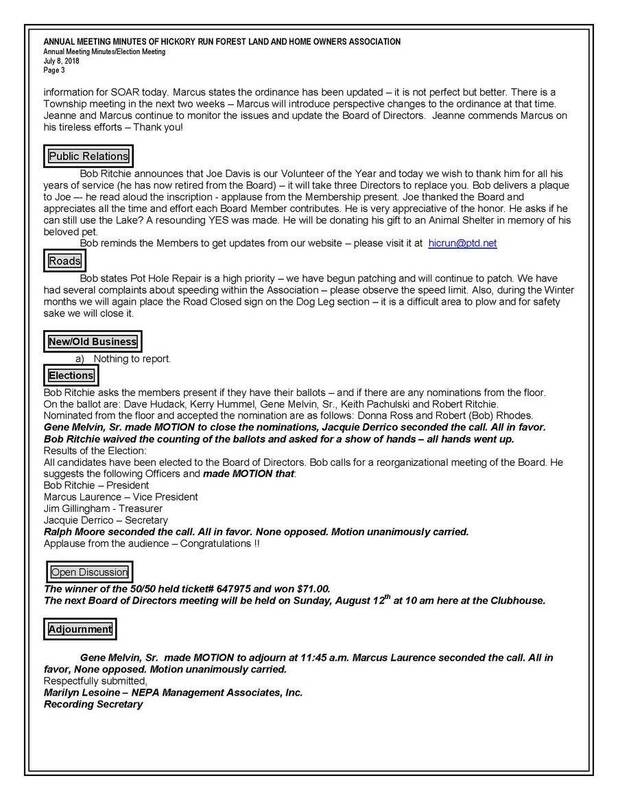 *Association due dates will be changing in the new year. 2019 dues will be able to be paid beginning January 1, 2019. A discount will be available if paid before January 31, 2019. All dues are due by February 28, 2019, after which a late fee will be assessed. *If you see trash or debris, but cannot move it yourself, please notify the association via an e-mail ([email protected]) or leave a message at 570-722-2400. Thanks! *We are having issues with bears in the community. Some tips on how to keep the bears away. · Do not leave pet food, bird seed, and/or garbage outside. · Do not leave food outside for any wildlife. · Clean your barbeque grill after use and never dump the grease outside. Eliminating the feeding source will help detract bears! Black bears will consume almost anything. Please visit www.portal.state.pa.us for more information on the Pennsylvania Black Bear. Your help to clean up after the bears is appreciated! Communities in Carbon County PA learned in 2016, that a major wind energy corporation has leased property from the Bethlehem Authority. The industrial wind corporation submitted a proposal to the Penn Forest Township Zoning Board to construct a wind turbine project comprising approximately 37 industrial wind turbines up to 525 ft high, with over a 300 ft spin range, along several ridges in Penn Forest Township. This forest is an important watershed since it provides drinking water for the city of Bethlehem. It is also adjacent to several communities, including Towamensing Trails, Hickory Run Forest, and Beltzville Lake Estates. Hundreds of acres of forest will be cleared for this project, destroying the habitat for the area wildlife and fragmenting the extensive forest. The negative impact on quality of life and property values is enormous. 1. Second application hearing is scheduled for 12/17/18 at 6pm at the Penn Forest Township Building. Please attend if you can.